Are “Palm oil Free” products better for health and the environment? Are “palm oil-free” claims helpful for the consumer? Are they anti-competitive? We presented at the Italian Chamber of Deputies (Thursday, March 21st, 2019) and the European Parliament (Thursday, April 4, 2019) the third edition of the comparative study ‘palm oil free, but more saturates and less sustainable’. Soon we will also present it in Madrid. The study has clearly shown that the “palm oil-free” message is highly deceiving for consumers. The third edition of the study, presented by Giacomo Bandini, analyses 96 food products, divided into 10 categories, within which there is a comparison of the total and saturated fats present in 100 g of the “free from” and “with” palm oil product. As the data collected highlights, “free from” products have, on average, less total and saturated fats than “with” products. The saturated fats average in “free from” products is 10.18 grams, whereas it is 9.13 for “with” products; 63% of “with palm oil” products have average saturated fat levels that are lower than the average in “free from” products. Plantations competing with oil palms have a greater impact on the environment and on biodiversity. For example, the yield per hectare of oil palm is very high: approximately 3.8 tonnes per hectare (t/h). The yield of alternative oils, on the other hand, is by far lower: 0.8 t/h for rapeseed oil; 0.7 t/h for sunflower seed oil; 0.5 t/h for soybean oil (WWF 2016 data). Please feel free to check out the summary of our study here: available in English and Italian. MP Beatrice Lorenzin – Former Italian Minister of Health – has emphasized how institutions should be more responsive and aware of free from claims. Today, hundreds of thousands of consumers risk being fooled by free from labels. According to the Former Minister, palm oil is a high-quality vegetable oil that must not be discriminated. Alberto Cirio – Member of the European Parliament – firmly pointed out how ‘free from claims are extremely dangerous and misleading for European consumers on several aspects. 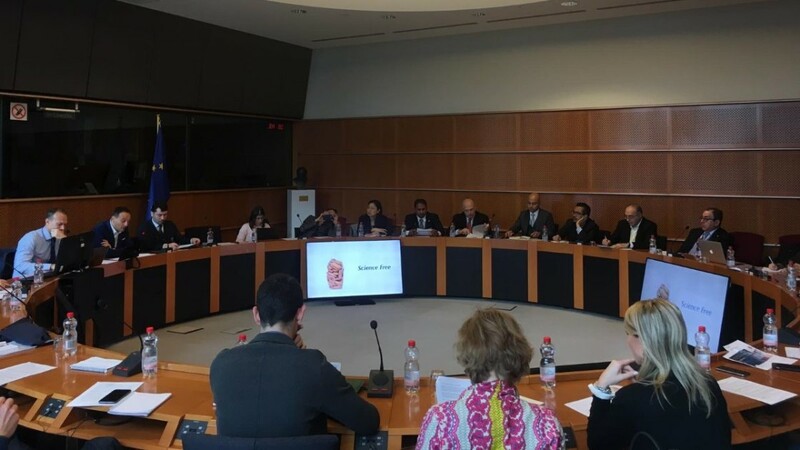 As Member of the Committee for public health and food safety, MEP Cirio devoted a considerable amount of time working on this topic, expansively analyzing all aspects involved in the use of palm oil in food, from health-related issues to environmental sustainability. Aude Mahy – Attorney-at-law with a focus on the food industry – asserted there is a lot of uncertainty when it comes to the legal assessment of the use of ‘free from’ claim in the EU due to a legislative vacuum. The EU Commission must intervene as soon as possible. Countries like the United States and Turkey have prohibited the use of ‘free from’ claims. This allows companies to discriminate against ingredients purely for commercial reasons. As Professor Pietro Paganini – Competere.eu – claimed palm oil in Italy (and other European countries) has been discriminated and boycotted merely to increase sales in a stagnant market, without any concrete and scientific argument. As stated by Margot Logman – Secretary General, European Palm Oil Alliance – ‘free form palm oil products’ are not healthier than products with palm oil. We must empower consumers with meaningful, fact-based information rather than feed them with confusing claims. Why not advertise a positive message like “with sustainable palm oil” rather than a negative one as “free from”? The anti-palm oil rhetoric has over the years, shifted from nutritional grounds to arguments focused on sustainability and the environment. Maria Vincenza Chiriacò – Euro-Mediterranean Center on Climate Change – explained how Sustainable Palm Oil is the vegetable oil with the best Life Cycle Assessments (LCAs). LCA is an analysis that measures the effects on the environment associated with a given product in every stage of its life cycle. Instead of boycotting it through ‘free from’ labels, we have to support sustainable palm oil and cooperate with local producers. As reported by Imkje Tiesinga – European Palm Oil Alliance – in 2017, 74% of Palm Oil imported in Europe for food was RSPO certified. Replacing palm oil with other vegetable oil would only lead to a more significant impact on the environment. This would not improve sustainability levels in any way, shape or form. The key to the future is sustainability, and the answer is sustainable palm oil. See you in Madrid, the next step of our presentation tour.